Turbidity is a measurement related to the particle content of a fluid. While it does not provide a direct particle count, it does deliver an indication of the optical clarity of the liquid, with the measurement being proportional to particle content. This is important to food and beverage manufacturers in maintaining consistent levels of quality and product character. A liquid processing industry, such as the food and beverage industry, can benefit from continuous monitoring of turbidity, as opposed to periodic sampling. The rate at which manufacturers process liquids generally negates the use of a sampling method due to the large amounts of material processed between sampling and the processing of their results. Continuous measurement provides the fastest response to any trending or immediate changes in the fluid character. One instrument manufacturer, Krohne, provides hygienic turbidity meters that can be installed, inserted into a pipe or vessel, to provide continuous turbidity readings. The instrument utilizes a near infrared light source, which eliminates the impact of medium color on the measurement. Krohne delivers a measuring system for monitoring the optical density of absorption of fluids in order to monitor continuous process results or to securely indicate changes. The process instrument has the capability to calibrate itself, preserving its high level of accuracy. Analog and digital outputs provide connective pathways to monitoring and control systems, and a number of product variants accommodate ease of use and several measurement ranges. More detail is provided below in the technical data sheet. Share you process instrumentation requirements and challenges with product application specialists, combining your process knowledge and experience with their product application expertise to develop effective solutions. 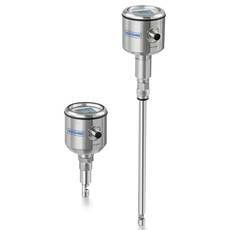 Hygienic Turbidity Meter for Food and Beverage Industry from Instrument Specialties, Inc.